Toss the mangos and chop the red chili with lime juice, a drizzle of oil. Add a pinch of pepper and salt. Toss again. 1. Combine all sauces in a sauce pot. Bring the sauce to a boil until it thickened slightly. Remove from the heat and set aside. 2. Rub the salmon with 1 tablespoon of olive oil and 2-3 tablespoons of the sauce. Pan fry for 3-4 minutes. Then flip until it reaches your desired doneness. Chop the salmon into bites. 3. Stir fry the red pepper slices, cabbage and carrots with 2-3 tablespoons of the sauce until the veggies become tender. 4. Pan fry 2 pcs of the PA Chapati for 3 minutes. 5. Remove the chapati to a clean counter, covering each chapati with a light layer of the sauce and sprinkle with the shredded cheese. Distribute the rice, then top the rice with the veggies and the chopped salmon pieces. Sprinkle with some more of the shredded cheese and cover with the other chapati. 6. 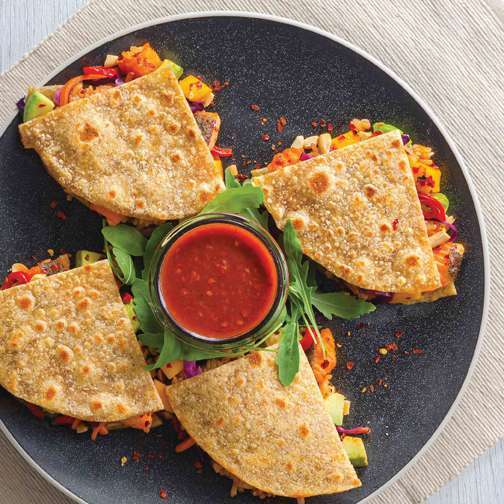 Cut the Quesadillas into quarters and serve with the spicy mango dressing. 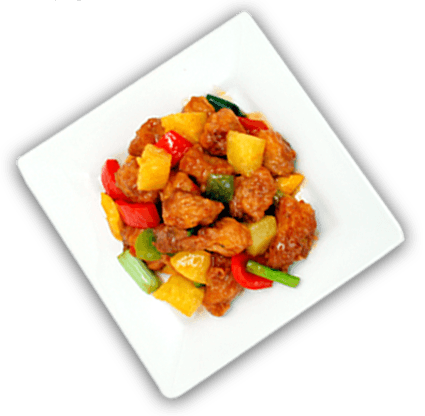 The spicy mango dressing can also be used as part of the fillings. 7. Sprinkle with fresh coriander leaves and serve.